Learn how leverage Spock 1.2 to slice a Spring context of a legacy application writing integration tests. Have you ever wanted, having some legacy application which you were starting to work on, to write some tests to get know what is going on and possibly be notified about regressions? That feeling when you want to instantiate a single class and it fails with NullPointerException. 6 replaced (with difficulty) dependencies later there are still some errors from the classes that you haven’t heard about before. Sounds familiar? There are different techniques to deal with hidden dependencies. There is the whole dedicated book about that (and probably a few other that I haven’t read). Occasionally, it may be feasible to start with the integration tests and run through some process. It may be even more “entertaining” to see what exotic components are required to just setup the context, even if they are completely not needed in our case. Thank you (too wide and carelessly used) @ComponentScan :). Injecting stubs/mocks inside the test context is a way to go as an emergency assistance (see the last paragraph, there are better, yet harder approaches). It can be achieved “manually” with an extra bean definition with the @Primary annotation (usually a reason to think twice before doing that) for every dependency at which level we want to make a cut of (or for every unneeded bean which is instantiated by the way). @MockBean placed on a field in a test is more handy, but still, it is needed to define a field in our tests and put the annotation on it (5? 10? 15 beans?). Spock 1.2 introduces somehow less know feature which may be useful here – @StubBeans. It’s worth to mention that @StubBeans is intended just to provide placeholders. In a situation it is required to provide stubbing and/or an invocation verification @SpringBean or @SpringSpy (also introduced in Spock 1.2) are better. I wrote more about it in my previous blog post. There is one important aspect to emphasize. @StubBeans are handy to be used in a situation when we have some “legacy” project and want to start writing integration regression tests quickly to see the results. However, as a colleague of mine Darek Kaczyński brightly summarized, blindly replacing beans which “explode” in tests is just “sweeping problems under carpet”. After the initial phase, when we are starting to understand what is going on, it is a good moment to rethink the way the context – both in production and in tests – is created. The already mentioned too wide @ComponentScan is very often the root of all evil. An ability to setup a partial context and put it together (if needed) is a good place to start. Using @Profile or conditional beans are the very powerful mechanisms in tests (and not only there). @TestConfiguration and proper bean selection to improve context caching are something worth to keep in your mind. However, I started this article to present the new mechanism in Spock which might be useful in some cases and I want to keep it short. There could be an another, more generic blog post just about managing the Spring context in the integration tests. I have to seriously thing about it :). Stubbing methods returning java.util.Optional with Spock is more tricky that you would probably expect. Get know how to do it efficiently. One of the nice features of the mocking framework in Spock is an ability to return sensible default values for unstubbed method calls made on stubs. Empty list for a method returning List, 0 for long, etc. Very handy if you don’t care about returned value in a particular test, but for example would like to prevent NullPointerException later in the flow. Unfortunately Spock 1.0 and 1.1-rc-2 (still compatible with Java 6) is completely not aware of types added in Java 8 (such as Optional or CompletableFutures). You may say “no problem” null is acceptable in many cases, but with Optional the situation is even worse. You may think – null will be returned on the getMaybeById() call, but it’s not. Caused by: org.spockframework.mock.CannotCreateMockException: Cannot create mock for class java.util.Optional because Java mocks cannot mock final classes. If the code under test is written in Groovy, use a Groovy mock. because Java mocks cannot mock final classes. 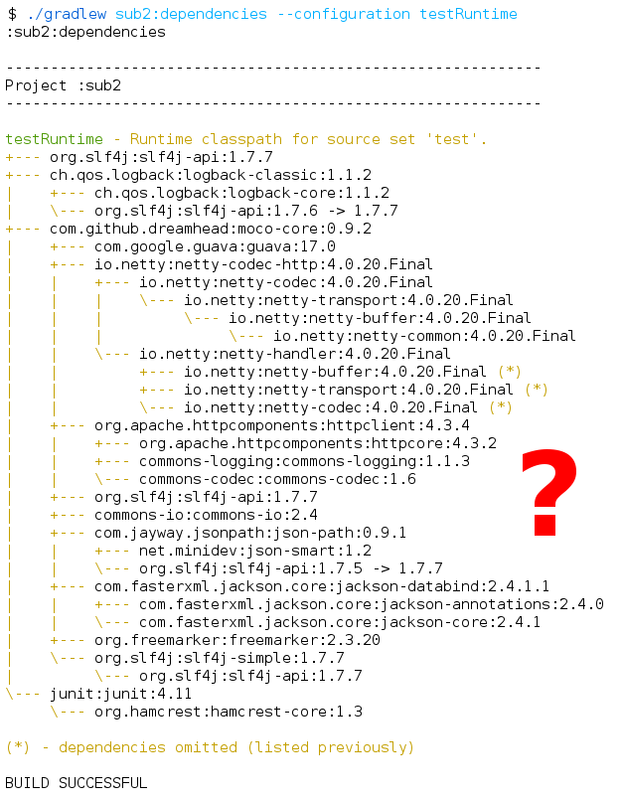 This test will pass (getMaybeById() just returned null), but there is an easier way to achieve the same result. However, this workaround is far from being perfect. Firstly, your colleagues may be surprised why a mock is created while only stubbing is performed (by the way, both stubbing and verifying interaction on the same mock is tricky itself in Spock, but this is a topic for an another blog post). Secondly, wouldn’t it be nice to have an empty optional (instead of null) returned by default? Please pay attention to consider Groovy truth implementation while making assertions with Optional. !result?.isPresent() would be fulfilled also for null returned from a method. Unfortunately in in that case an enhanced more compact stub creation syntax available in Spock 1.1 cannot be used with our Stub8() method. All because Spock will not be able to determine it’s type looking on he left side on assignment. In the end, however, it is much shorter than setting defaultResponse in an every stub creation. Thanks to exploring some Spock internals related to a stub and mock creation it was possible to enhance default strategy for smart responses for unstubbed calls to nicely support Java 8 features. This is just one of the topics I covered in my advanced “Interesting nooks and crannies of Spock you (may) have never seen before” presentation gave at Gr8Conf Europe 2016. You may want to see it :-). Btw, the good news is that upcoming Spock 1.1(-rc-3) will contain native support for returning sensible default values for unstubbed Optional method calls. Self promotion. Would you like to improve your and your team testing skills and knowledge of Spock quickly and efficiently? I conduct a condensed (unit) testing training which you may find useful. Learn how to visualize complex input parameters in parameterized tests in the way improving the readability of the test report. To present different available approaches I will use a very simplified version of an account & invoice related domain implemented with DDD in one of the projects I worked in. The main class here is Invoice which represents an invoice :). The object is immutable (here with Groovy AST transformation, but it could be also achieved with Project Lombok or manually) which means that methods modifying a state return a new version of this class. There is also Account class with an amountToPay() method returning amount to pay based in open invoices. As the first idea one could be tempted to modify toString() method implementation to, for example, display only 2 of the 10 fields in a class. However, it is a bad idea to change production toString() just for the better output in tests. What is more, other tests or error reporting in a production system can prefer to display more information. Luckily in Spock we have two nice techniques to cope with it. Test/specification names in Spock can be enhanced with #parameterName (not with $ character used internally by Groovy which is not allowed in a method name) placed in a test name or in an @Unroll annotation. In addition there is an ability to use object property value or call a parameterless method. It’s nice to get just two fields from an object, however, in many cases we don’t want to add an artificial formatting method to production code just to be used in tests. A tip. Don’t forget to enable unrolling of paremterized tests to instruct Spock to create a separate (sub)test for every input parameters set. It can be done manually by placing @Unroll annotation on an every parameterized method or at the class level. Alternatively the spock-global-unroll extension can be used to turn it on automatically in the whole project. Luckily, as an alternative it is possible to define an another artificial input parameter directly in a test. It looks like a ordinarily variable, but has access to a set of input parameters (for a given iteration) and can operate on they. That extra parameter is treated by Spock equally to others (however usually there is no need to reference to it in a test code – beside a test name). Implementation note. Methods createOpenForAmount() as well as paid() and cancelled() are implemented in a test specific InvoiceTestFixture class. A tip. Pay attention that in opposite to regular parameters in Spock the artificial one is created with an = operator not with <<. The aforementioned techniques can be used to improve the readability of your test execution report. It’s useful during the development, but what is even more important it becomes indispensable if Spock is used for Behavior Driven Development and reports are read by, so called, Business People (i.e. need to be worded in the specific way). [OT] The reason to bring up this topic is a fact that recently two colleagues of mine were struggling with that issue in their tests. Unfortunately they overlooked that slide in my advanced Spock presentation at Gr8Conf EU ;). Blessing in disguise, I was in the office to support them immediately. Nevertheless, not so long ago I’ve seen a presentation by Scott Hanselman about productivity. I liked the idea that every good question is worth to be answered on a blog. Replying privately (especially via email) usually can help only just one person. Writing a blog post and sending that person a link in addition can help other people struggling with the same issue. Spock heavily leverages operator overloading (and Groovy magic) to provide very compact and highly readable specifications (tests) which wouldn’t be able to achieve in Java. This is very clearly visible among others in the whole mocking framework. However, preparing my Spock training I found a place for further improvements in a way how mocks and spies are created. The type inference in IDE works fine (there is type aware code completion). Nonetheless, this syntax is usually less readable for Java newcomers (people using Spock to tests production code written in Java) and in general for people preferring strong typing (including me). The first impression about this code snipped is – very verbose. Well, it is a Java way – why should we expect anything more ;). IDE complains about unsafe type assignment and without getting deeper into the logic used in Spock it is justified. Luckily the situation is not hopeless. Preparing practical exercises for my Spock training some time ago gave me an excuse to get into the details of implementation and after a few minutes I was able to improve the code to make it work cleanly in IDE (after a few years of living with that limitation!). No warning in IDE anymore. Multiple times in my career I experienced a well known truth that preparing a presentation is very educational also for the presenter. In a case of a new 3-day long training it is even more noticeable – attendees have much more time to ask you uncomfortable question :). Not for the first time my preparations resulted in a new feature or an enhancement in some popular libraries or frameworks. Would it be useful to unroll all parameterized Spock tests automatically? I’ve been always frustrated with the need to add @Unroll annotation to every parameterized test/feature (or at least at the class/specification level) to make unrolling works in Spock. It was even worse to deal with the code with already missing @Unroll annotations and cryptic test results. For backward compatibility unrolling will rather not be enabled by default in the foreseeable future, but luckily there is a quick solution. That’s all. spock-global-unroll is a global extension which is activated automatically by Spock. All parameterized Spock tests are unrolled without the need to use @Unroll annotation. Automatic unrolling can be disabled for a particular class by putting @DisableGlobalUnroll on it. The nice thing is that the @Unroll annotations manually placed at the test (feature) level can be used to unroll particular tests anyway (even if automatic unrolling has been disabled for given class). To override default test name expanding (with #placeHolders in a test name) @Unroll annotation with a custom text can be used on the top of feature method or at the specification level. Being able to implement automatic tests unrolling within 15 minutes I decided to share it with the community – maybe there are others who don’t like to write boilerplate code :). The code written to achieve it has just a few lines of production code (of course there are also 3 test classes to verify if the extension works as expected :) ). This shows the power of Spock extensibility. Update 20160521. I added automatic migration scripts in the project README to make a migration easier. 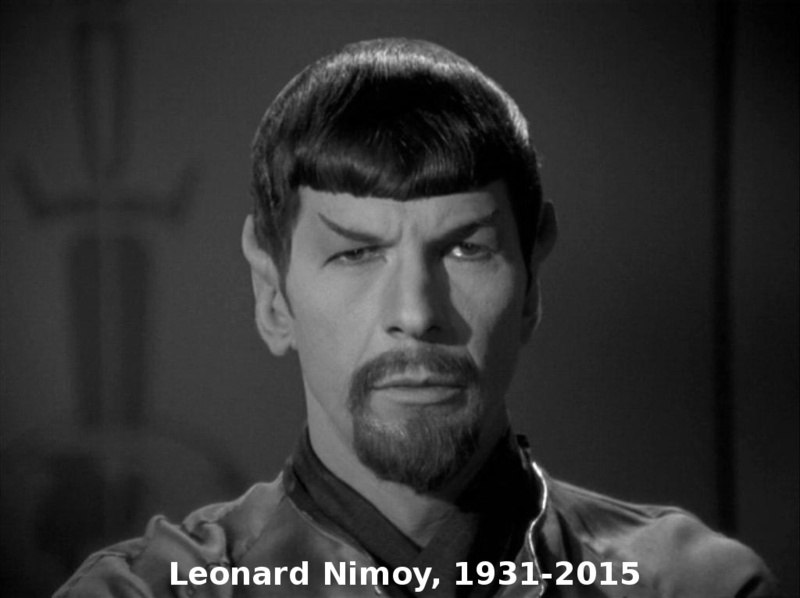 Btw, if you would like to find out more about “Interesting nooks and crannies of Spock” I will be speaking about them in May and June at GeeCON 2016 in Kraków, Gr8Conf 2016 in Copenhagen and Devoxx Poland again in Kraków. Self promotion. Would you like to improve your and your team testing skills and knowledge of Spock quickly and efficiently? I conduct condensed (unit) testing training which you may find useful. Quick tutorial how to configure Spock 1.0 with Groovy 2.4 using Maven and Gradle. Spock 1.0 has been finally released. About new features and enhancements I already wrote two blog posts. One of the recent changes was a separation on artifacts designed for specific Groovy versions: 2.0, 2.2, 2.3 and 2.4 to minimize a chance to come across a binary incompatibility in runtime (in the past there were only versions for Groovy 1.8 and 2.0+). That was done suddenly and based on the messages on the mailing list it confused some people. After being twice asked to help properly configure two projects I decided to write a short post presenting how to configure Spock 1.0 with Groovy 2.4 in Maven and Gradle. It is also a great place to compare how much work is required to do it in those two very popular build systems. Maven does not natively support other JVM languages (like Groovy or Scala). To use it in the Maven project it is required to use a third party plugin. 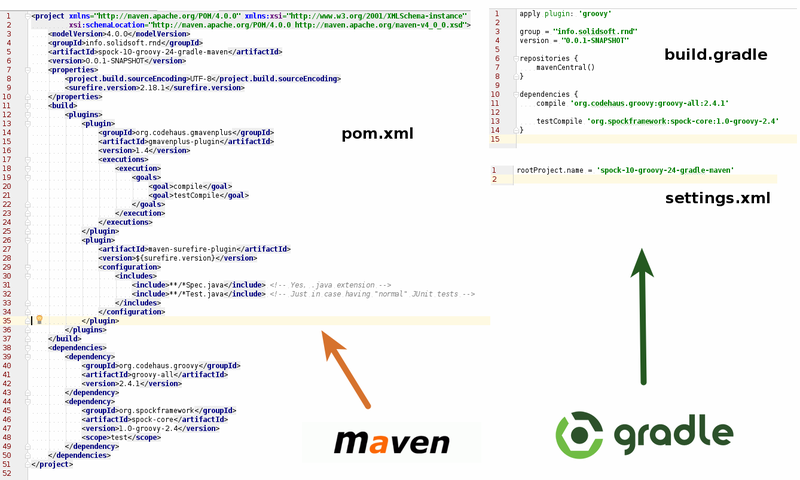 For Groovy the best option seems to be GMavenPlus (a rewrite of no longer maintained GMaven plugin). An alternative is a plugin which allows to use Groovy-Eclipse compiler with Maven, but it is not using official groovyc and in the past there were problems with being up-to-date with the new releases/features of Groovy. Please notice that it is needed to include **/*Spec.java not **/*Spec.groovy to make it work. Together with other mandatory pom.xml elements the file size increased to over 50 lines of XML. Quite much just for Groovy and Spock. Let’s see how complicated it is in Gradle. Gradle has built-in support for Groovy and Scala. Without further ado Groovy plugin just has to be applied. Together with defining package group and version it took 15 lines of code in Groovy-based DSL. Btw, in case of Gradle it is also very important to match Spock and Groovy version, e.g. Groovy 2.4.1 and Spock 1.0-groovy-2.4. Thanks to embedded support for Groovy and compact DSL Gradle is preferred solution to start playing with Spock (and Groovy in general). Nevertheless if you prefer Apache Maven with a help of GMavenPlus (and XML) it is also possible to build project tested with Spock. 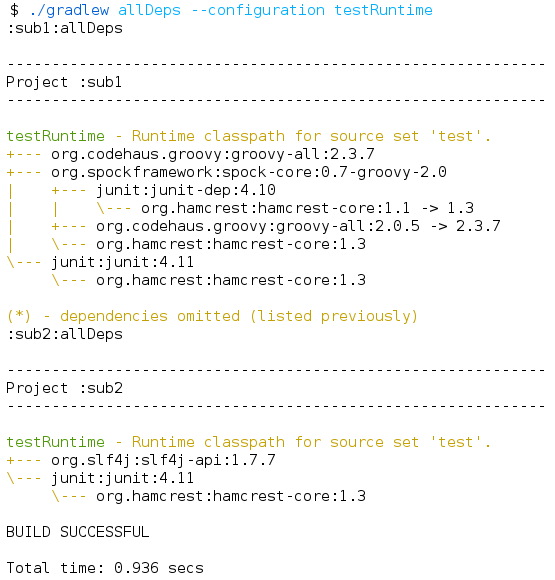 The minimal working project with Spock 1.0 and Groovy 2.4 configured in Maven and Gradle can be cloned from my GitHub. Note. I haven’t been using Maven in my project for over 2 years (I prefer Gradle), so if there is a better/easier way to configure Groovy and Spock with Maven just let me know in the comments. Note 2. The configuration examples assume that Groovy is used only for tests and the production code is written in Java. It is possible to mix Groovy and Java code together, but then the configuration is a little more complicated. Note 3. If you are interested in get know useful tips and tricks about using Spock Framework to test your Java and Groovy code I will have a presentation about that at 4Developers conference, April 20th, 2015. In my previous post I presented how to display and filter dependencies in multi-module Gradle build. This time I will show how to quickly discover why become a dependency of our project. Real life use case. Multi-project Gradle build. In the runtime SLF4J reports problem with two discovered implementations: slf4j-logback and slf4j-simple. Logback is used in the project, but where slf4j-simple came from? Of course it is not listed in our build.gradle, but it is packaged into the WAR file and makes a conflict. With the knowledge from the previous post one of the possible solutions is to write allDeps task, dump dependencies to file and find a rogue dependency. It is not pretty visible on the first sight even for that small project with only 4 direct dependencies. But luckily there is a better way. In addition to dependency task (implemented in DependencyReportTask), Gradle has one more similar task – dependencyInsight (implemented in DependencyInsightReportTask. It allows to limit a dependencies tree only to selected dependency (also transitive). would do its job in all subprojects. dependencyInsight task can be very useful when tracking down suspicious and not expected transitive dependencies in the project. An ability to make it multi-project build friendly makes it even more powerful. gradle dependencies allows to display dependencies in your project printed as pretty ascii tree. Unfortunately it does not work well for submodules in multi-project build. I was not able to find satisfactory solution on the web, so after worked out my own that blog post arose. In fact Gradle is right. Root project usually has no code and no compile or runtime dependencies. Only in case of using plugins there could be some additional configurations created by them. When called gradle allDeps it executes dependencies task on all subprojects. All dependencies belong to us, but some parts of the tree looks similar (and duplication is a bad thing). Especially configurations default, compile and runtime and the second group testCompile and testRuntime in most cases contain (almost) the same set of dependencies. To make the output shorter we could limit it to runtime (or in case of test dependencies testRuntime). 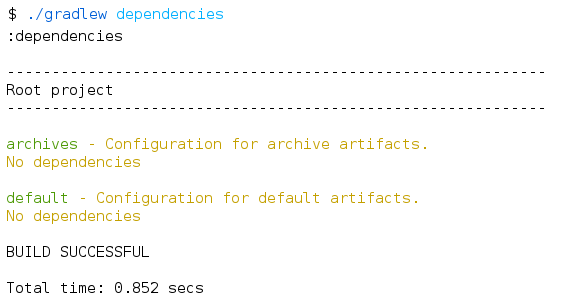 dependencies task provides convenient parameter --configuration and to focus on test dependencies “gradle allDeps --configuration testRuntime” can be used. Where it could be useful? Recently I was pair programming with my old-new colleague in a new project (with dozens submodules) where SLF4J in addition to expected slf4j-logback provider discovered on a classpath also slf4j-simple. We wanted to figure out which library depends on it. Logging dependencies tree to file with a help of grep gave us the answer. As a bonus during my fights with DependencyReportTask I found an easier way how get know who requires given library. I will write about it in my next post. When writing integration tests it is sometimes required to set up environment initial conditions/state before/after a given test or the whole specification. Upcoming Spock 1.0 expands the number of available options to do it in the convenient way. This is the second part of the series about new and noteworthy in (upcoming) Spock 1.0. System properties provides information about JVM configuration and the environment like JVM vendor and version, operating system, classpath, locale or a time zone. Some of them can impact the way our application works. The following example checks if the protection before running a dangerous program as root works properly on Unix machines. To not affect other tests @RestoreSystemProperties restores the original system properties. The extension can be activated using @RestoreSystemProperties annotation. It can be placed on a feature method to be applied right after the given test only or on a class to restore system properties after every test in the specification. The behavior in the second case is identical to placing the annotation on every test method. Internally Spock makes a copy of a system Properties structure before a test and restores it after. One of the things which make Groovy language so powerful is metaprogramming – an ability to modify classes (e.g. add/modify new methods) at runtime. That could look like hacking (and that is true), but in some specific cases it is very useful (see Grails and GORM for creating database queries when non existing methods – like findByFirstNameAndSecondName(...) or writing a custom DSL like 6.minutes.ago). MetaClass operations are usually executed at the class (not instance) level what generally causes that they affect every class instance in given class loader. GORM like changes done in multiple test could interact each other causing tests to fail. For that cases @ConfineMetaClassChanges extension (available already in previous Spock version) was created. @ConfineMetaClassChanges annotation can be placed on a feature method to restore MetaClass to the state just before that test or on a class to restore system properties after the last test in the specification to the state before calling the setupSpec method. Note that @ConfineMetaClassChanges behavior placed on a specification level is different (once after the last test) than @RestoreSystemProperties behavior (every time after every test). Another already existing, but rarely known and used extension is @AutoCleanup. Usually external resources are allocated in setup/setupSpec methods and released in cleanup/cleanupSpec methods. But Spock, the same as pure JUnit, support auto initialization instance variables (fields) before every test/feature (which overrides default Java behavior when a field is initialized only once when a class instance is created). To make it easier to release those inlined resources can be annotated with @AutoCleanup to call close method (or any other method defined as a parameter) in the clean up phase. @AutoCleanup supports both instance variables (the method is called after every tests) and static/@Shared fields (the clean up is performed after the last test). All errors during clean up are caught to not interrupt test execution. By default there are logged, which can be disabled using quiet parameter @AutoCleanup(quiet = true). Where can I find Spock 1.0? Please notice that blog post is about features available in Git branch planned to become Spock 1.0 sometime in the future. They are currently available only in a 1.0-SNAPSHOT version in a separate repository. As not being released (at the time of writing) they could look different or even (in the extreme case) be not available in the final version. Be aware. Mentioned extensions were designed for integration tests and because of class loader (or system) wide changes it is not safe to execute more than one test in the same time. Therefore it is important to separate pure, very fast and independent, unit tests from integration tests to (inter alia) allow unit tests to run in parallel. After @Require and @IgnoreIf this is the second post about changes in upcoming Spock 1.0. The examples was written using Spock 1.0-groovy-2.0-SNAPSHOT and they can cloned from GitHub. May the Spock be with you! Some tests (especially integration tests) should be run only if certain conditions are (or are not) met. Upcoming Spock 1.0 provides new @Requires and improved @IgnoreIf extensions to handle that requirement in a convenient way. 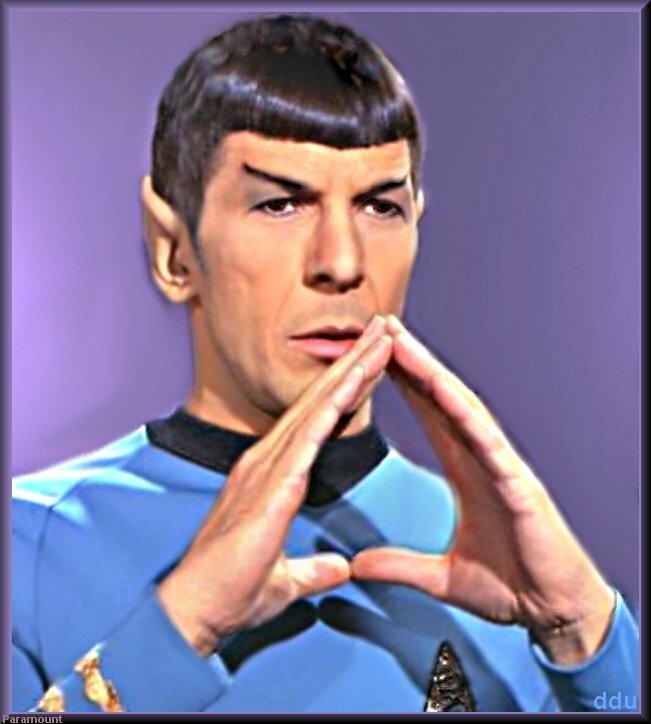 The latest stable Spock version (0.7) has been released in October 2012 (~2 years as the time of writing). There have been made hundreds of commits to Git repository since then and many new features and improvements are already available in the current SNAPSHOT version. Unfortunately the “New and Noteworthy” section in the documentation doesn’t cover those changes and the only way (as I know) to get them know is digging into Git commits. As a Spock user I was curious what new is around the corner, so I did that job which resulted in the presentation at Confitura (in Polish). A as bonus I planned a series of blog entries describing those more interesting features and possibly also an update of Spock documentation. This is just the first part of the changes in (upcoming) Spock 1.0. There is much more to discover and I will be presenting that in future blog posts. @Requires allows to run given test (or the whole specification) only if given criteria are met. It is opposite to already known from Spock 0.7 @Ignore extension which allowed to ignore the given test (or the whole specification) using access to system properties (properties – System.getProperties()), environment variables (env – System.getenv()) and java version (javaVersion – System.getProperty("java.version")). In Spock 1.0 branch they both are much more powerful. Testing my examples in practice I was surprised that a system property “os.arch” returns not a processor architecture taken from an OS, but a JVM version. So, be aware that running a 32-bit JVM on 64-bit system will return “i386”. Hopefully usually that knowledge is not important (unless for example the native libraries are used). In addition to the new @Requires extension it and its twin @IgnoreIf have got new internal abstraction to simplify the way how the operating system information and a JVM version can be accessed. @Requires (the same as @IgnoreIf) can also use static methods to define a condition (which is available, but less known in Spock 0.7). Those methods can be declared inside a given class, in an another class or (when using Groovy 2.3+) in a trait. Please pay attention to the static import in this example. Even though that code without an import looks ok and Idea sees the method it will fail at runtime with groovy.lang.MissingMethodException: No signature of method: (...). This is caused by the way how Spock internally tries to resolve references in a Closure. For detailed explanation see the next paragraph. How does it internally work (for the curious)? The first point causes that Groovy compiler ignores unresolved references. At the compilation time the execution context can be unknown (a Closure can be passed as a parameter far away from the declaration place). The used references will be resolved at runtime and here the second point applies. PreconditionContext is a delegate class for @Requires and @IgnoreIf providing an execution context. Its getOS() or getJvm() methods are resolved and executed when os or jvm properties are used in the annotation Closure. In addition to set a dedicated delegate, a resolve strategy is changed to not bother with an enclosing class and try resolve unresolved references only using PreconditionContext. If you are new to Groovy and feel confused with the internals I propose you to take a look at the introduction to Groovy Closure. If you like it there is a lot more things to get know about Groovy Closure and its power. Please notice that blog post is about features available in Git branch planned to become Spock 1.0 sometime in the future. They are currently available only in a 1.0-SNAPSHOT version in a separate repository. As not being released (as the time of writing) they could look different or even (in the extreme case) be not available in the final version. Be aware. New @Requires extension and the enhancements in @IgnoreIf are the first part of the series about new and noteworthy in upcoming Spock 1.0. When will it be released? Citing John Carmack “It’ll be done when it’s done”. If you would like to bring the release closer donate your time and contribute to the project. Post written using Spock 1.0-groovy-2.0-SNAPSHOT. Examples can be cloned from GitHub. Test quickly and prosper :).